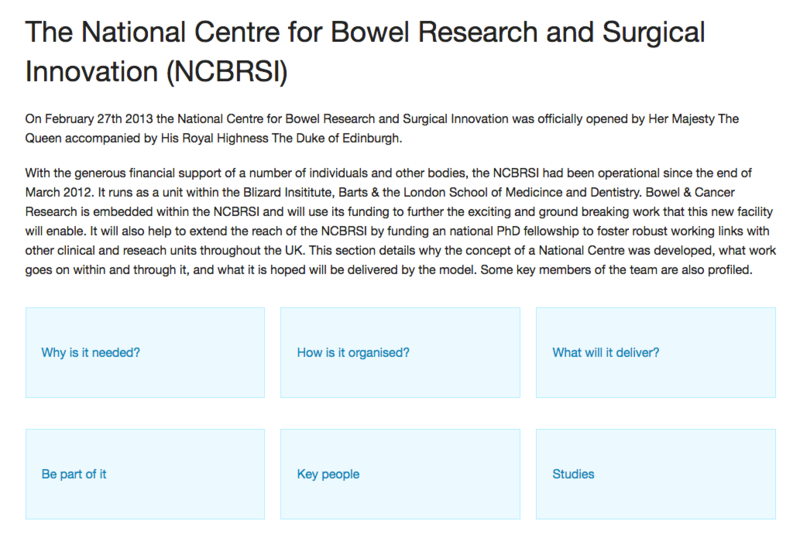 Bowel & Cancer Research funds innovative research into bowel cancer and other bowel diseases. 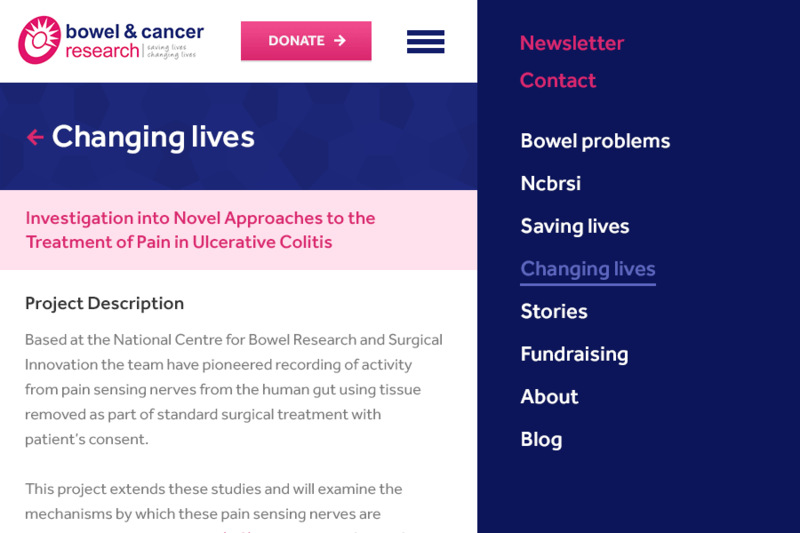 Through its funding of the National Centre for Bowel Research and Surgical Innovation and its continuing support for research from there as well as around the UK, Bowel & Cancer Research will pursue its vision, that: No-one should die of bowel cancer, have to live with chronic bowel disease or face life with a permanent stoma. 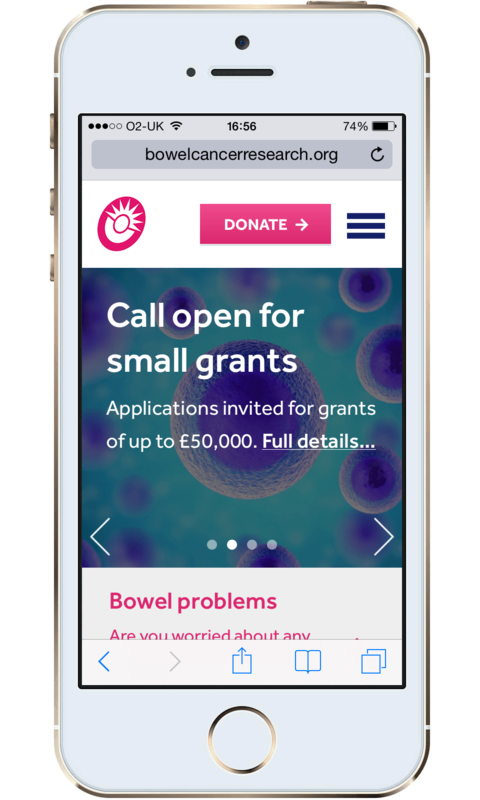 Bowel Cancer Research approached us to help them build upon their existing brand and create a fresh new responsive site. 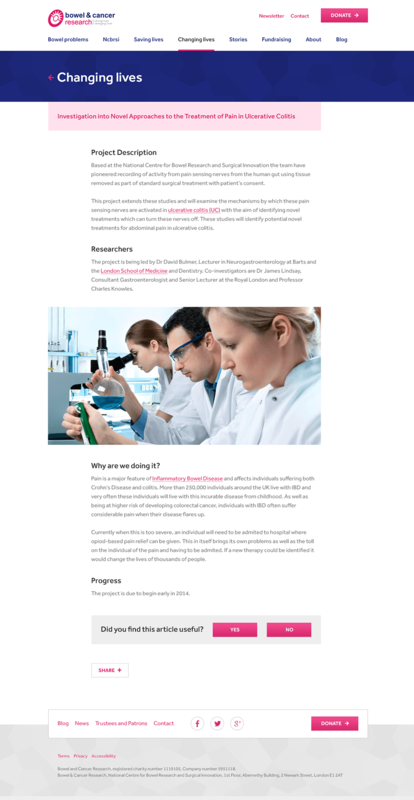 Firstly, we worked with them to resolve some of their problems with the existing information architecture of their site. 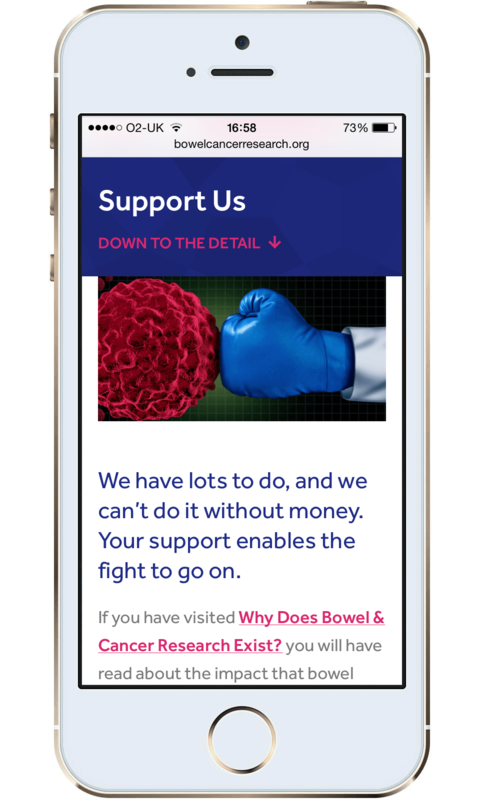 As well as creating their new site map, we helped them visualise these changes by building a prototype for the new site using the wonderful Foundation framework from Zurb. This helped us rapidly develop the new structure of the site while working with their existing content. As before, the new sites' content is managed with WordPress and we ensured there was very little new functionality for the client to learn besides spending a little time tidying up some of the content formatting. 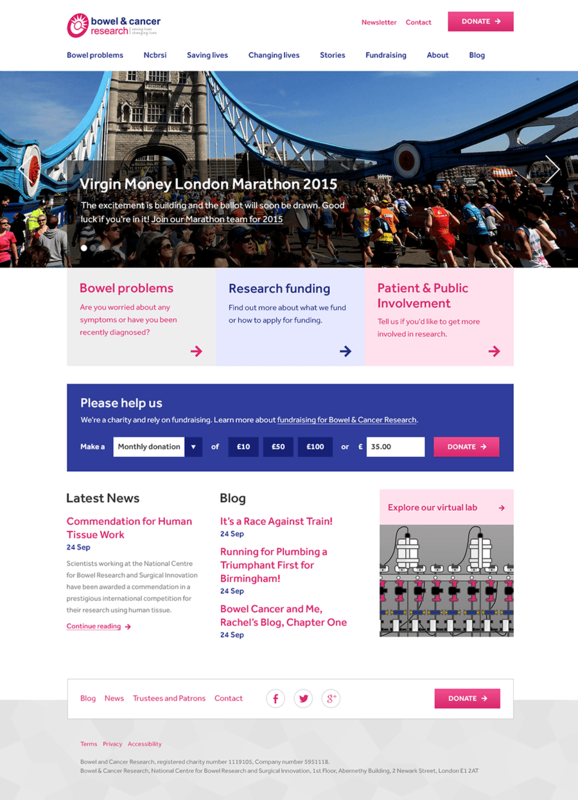 The new WordPress theme we've built is fully responsive as has really helped them move forward from their old, rigid site. 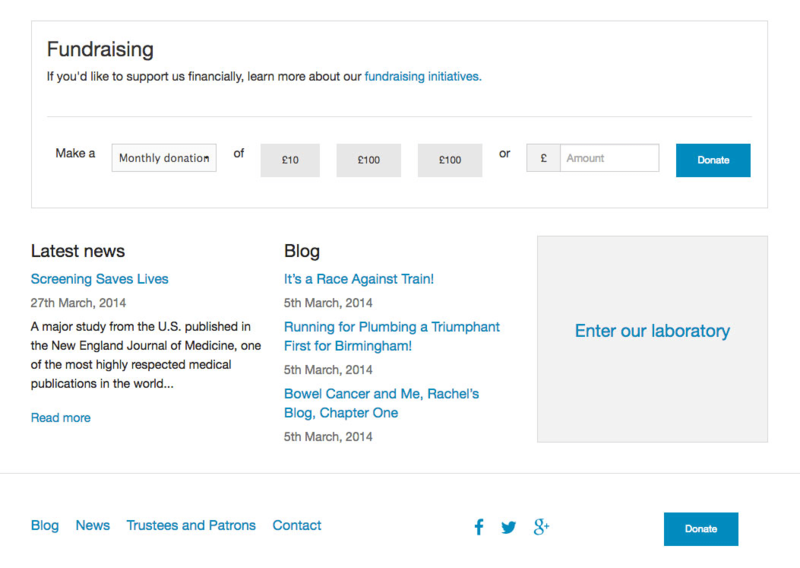 The new site also integrates with their existing, 3rd party donation and contact management systems. It was a pleasure to work on our project with Supereight. The team was knowledgeable, helpful and receptive, moving the project on at a good pace for everyone. On completion the few teething problems were sorted quickly. The main brief; to adapt our online presence to work across all platforms was delivered in full, I am delighted with the results.